Griffin Reinhart never fully could comprehend the comparisons being made to his father, Paul, whenever he was asked about the standout defenseman for the Calgary Flames of the mid-1980s. Griffin and his two brothers, Max and Sam, never had an opportunity to watch their father play since all three were born after Paul retired from the game following the 1989-90 season. That made watching him on television during a replay of a Flames-Oilers game from the 1988 playoffs all the more special. "It was funny watching him," Griffin told NHL.com. "He plays kind of the same style I do and he makes the same mistakes as me." That's where Paul set the record straight, however. "Dad always tells me to do what he says and not what he did, so it's pretty funny," Griffin said. Much like Paul Reinhart, Griffin skates as well as any defender eligible for the 2012 NHL Draft, usually can hit his target while on the move, and is a force on the power play. In his second full season with the Edmonton Oil Kings of the Western Hockey League, Griffin had 12 goals (five on the power play), 36 points and a plus-23 rating in 58 games. He was just as good in the WHL playoffs, totaling eight points and a league-leading plus-14 rating as the Oil Kings won the league title and qualified for the MasterCard Memorial Cup. While the best NHL comparison might just be his father, who was selected by the Atlanta Flames with the 12th pick of the 1979 draft, Griffin said he considers himself a hybrid of Nashville's Shea Weber and Philadelphia's Chris Pronger. "In my own zone, I have a lot of poise with the puck and I don't ever panic," he said. "I can make the first pass out and hit the tape … just keep everything simple. Weber and Pronger are two guys I really kind of watch a lot and I combine their traits -- that's the style I want to play and sometimes I can." NHL Central Scouting has Reinhart at No. 10 in its final ranking of North American skaters for the 2012 NHL Draft. "He's got nice, soft hands for a big defenseman, can run the power play and has a big shot -- both the wrist shot and slapper," Central Scouting's B.J. MacDonald told NHL.com. "He moves the puck as well as anyone in this year's draft and I like the way he thinks the game. He's got a nice pro style that will make for an easier transition to the (NHL)." The lofty expectations haven't gotten the best of Reinhart. "I just try to play my game and one of the biggest things is I don't let any of the pressure get to me … I'm not overly worried about moving up or down in the rankings," Reinhart said. "I know, every night, I just have to be consistent and play my own game." It's that attitude that has impressed NHL scouts and general managers. "He's really improved his play in the second half of season and is such an underrated passer," MacDonald said. "He's using his size (6-foot-4, 207 pounds) more effectively, has great positioning and anticipation. Older brother Max and younger brother Sam are forwards for the WHL's Kootenay Ice, meaning Griffin is the only one who truly followed in the footsteps of his dad along the blue line. "I've always been a bigger kid and skating wasn't my strongest skill back in the day, so I always just played on the blue line," Reinhart said. "You're able to get away with it back in minor hockey. But my skating did improve, and in the WHL it had to because you have to be an agile player and mobility is a huge part of the game." Griffin considers his brother Max, drafted by the Calgary Flames in the third round (No. 64) of the 2010 draft, the best skater of the three brothers (Sam isn't draft-eligible until 2014). 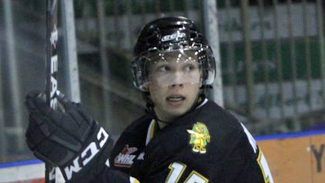 Griffin, however, could wind up as the highest-drafted WHL player among the Reinhart clan. "I never really talked about (being the highest-drafted Reinhart)," Griffin said. "My dad always said to just do your best and you'll go where you're supposed to." Even though he hasn't been drafted, Griffin already has one leg up on Max by virtue of his participation in the 2012 CHL/NHL Home Hardware Top Prospects Game on Feb. 1. Reinhart, whose nickname is "Big Cat," even scored a goal to help Team Orr to a 2-1 victory against Team Cherry. "I was looking forward to it because it was something I was able to accomplish that my older brother didn't, so it was a good experience," he said. Red Deer defenseman Mathew Dumba, No. 11 among those 2012 draft-eligible North American skaters, always has been impressed with the way Reinhart goes about his business. "There are those comparisons to Pronger because he's always in position and makes simple reads," Dumba told NHL.com. "He's relaxed, calm and collected, and off the ice he's the same way. He's very easy-going and fun to be around." When asked to name the one forward he considers the toughest to defend, Reinhart needed only a few seconds. "I try to play everybody tough, but there are key guys like Brendan Gallagher (of the WHL's Vancouver Giants) and Mark Stone (WHL's Brandon Wheat Kings), who are pretty tough," Reinhart said. "I try and watch my brother (Max) closely when we play Kootenay, as well. I don't want him trash-talking me. There are a lot of skilled forwards from every team on every line, but it's a matter of staying focused."